The life of a pizza delivery driver is not a glorious one. The long hours, the wear and tear on your vehicle, the 20 or so pounds you inevitably gain from eating nothing but mozzarella and pepperoni all day … and don’t even get me started on those giant mutant turtles stealing from you every time your back is turned. But the worst part about the job? Getting stiffed. It happens — A LOT — and the only thing more frustrating than seeing a big ol’ goose egg in the “tip” section of a receipt is knowing that, come this time next week, you’ll probably have to deliver to the same ungrateful jerk again. Of course, there are also those customers who make the job (almost) worth it. I’m talking about the big tippers. If you’ve ever worked in the service industry, you know how the smallest of gestures can make a huge difference. Something as simple as a few extra bucks and a smile can turn a bad day into a good one, especially if you’re dealing with personal issues that extend beyond your job. Case in point: Jeff Louis, a 22-year-old delivery driver for Gionino’s Pizzeria in Mentor, Ohio, who recently received the tip of a lifetime. Late last month, Jeff was called to work ahead of his regularly scheduled shift to deliver “seven or eight” pizzas to the Life Point Church, a nondenominational Christian community. He loaded the stack of pies into his car and trudged across town. Upon arriving at the church, Jeff received an unusual request: Before he could leave, he would have to bring one of the pies up to the congregation’s pastor, Ken Wright, who was on stage giving a sermon. Jeff was shocked and clearly moved. He immediately posted a heartfelt, teary-eyed account of the story on YouTube. The twist? Jeff is a former addict in the early stages of recovery. “I’m just trying to get my life back, and it just really truly amazes me that people who don’t even know me just wanted to help me out that much,” he said, choking on the words. 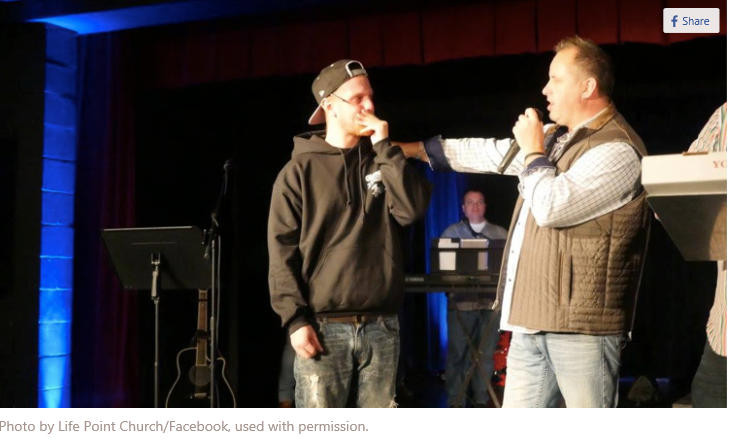 While no one at the church was aware of Jeff’s personal struggles with addiction prior to his delivery, I imagine that Pastor Wright would credit their impromptu meeting to the man upstairs. “We can change the world one life at a time,” Wright said in an interview with local news affiliate WKYC afterward. It looks like Life Point Church is living up to that motto. The incredible gesture (and Jeff’s video) have since gone viral, with even Manny Pacquiao sharing the story on his Facebook page. In the meantime, people have been flooding Jeff’s Facebook page with congratulations and thanks, calling him an inspiration. But to Jeff, his turn of fortune is a little simpler to explain than that. The lesson here is a simple one: Always be kind to strangers, but be especially kind to the strangers who happen to be bringing you God’s (or Italy’s) greatest gift to mankind. Wow this is so wonderful thank you for sharing it! Tears of inspiration I love this so much!